One day a few years ago, 95-year-old Frank Walsh strolled into Wanker's Corner Saloon and Cafe for a soda. He and owner Cooper Maixner got to talking. They since have become good friends and Walsh stops by the shop regularly. In fact, Dennis Cater happened to meet Walsh outside of Wanker's one day and has since noticed that Walsh "brightens the day" of anyone he meets. 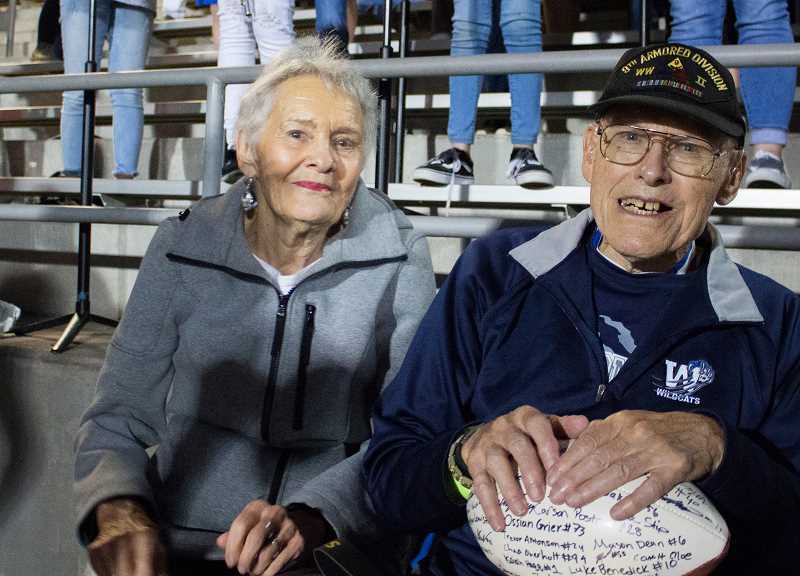 So when Maixner and Cater heard that Walsh, a World War II veteran, wanted to visit Washington, D.C., with his girlfriend, Rosemarie Acker, during the 75-year D-Day anniversary commemoration June 6, they decided to help. "He's a good friend of ours, and I personally really value our veterans, especially the World War II veterans," Maixner said. "They're the greatest generation, and they aren't making any more of them, so we want to help Frank out however we can." Wanker's, located at 8499 Main St in Wilsonville, will host a fundraiser for Walsh and Acker's trip beginning at 2 p.m. Sunday, March 24. Meanwhile, Forward Assist, a Wilsonville-based nonprofit organization dedicated to helping veterans, will fund the remainder of the expenses and Cater, president of Forward Assist, and his wife will accompany Walsh and Acker on the six-day excursion. Walsh served in World War II from 1943 to 1946 in the Army's 9th Armored Division, was deployed in France, Germany and Belgium, was awarded a Purple Heart, served in Munich when the war ended, and became a teacher following his service. Cater said Walsh had been to the nation's capital before, but the trip will be the first time he will visit all of the iconic monuments. The fundraiser will feature a performance by folk rock artist Lindsy Scott, a raffle of items like coolers, golf bags, electric guitars and Vanguard Brewery growlers, and a portion of the store's proceeds that day will go toward the couple's trip. Maixner hopes to raise a couple thousand dollars for the trip, which Cater estimates will cost between $5,000 and $8,000. "People in this community seem to really support each other. But even more than that, our veterans and senior citizens seem really willing to help," Maixner said. "I have guests who say 'If I can't make it, I'll leave some money for him.'" Forward Assist typically organizes fishing and hunting trips for veterans, but Cater made an exception for Walsh. "He's a very remarkable man," Cater said. "You don't meet too many people like Frank. He's special." Maixner has enjoyed getting to know Walsh and hearing some of his war stories and said Walsh will share some of them during the March 24 event. "He's just a great guy. I hope I have his energy and his zest for life at 65 or 75 — much less 95," Maixner said. "He's just a really positive, upbeat guy that stays on the move and stays busy. He amazes me."